Before you go and spend $300 on a new Samsung Galaxy Watch or even more on an Apple Watch, we’ve got another option you’re definitely going to want to consider. Why should you consider the Amazfit Bip Smartwatch by Huami over those other models? Let’s start with the fact that it lasts for up to 30 days on a single charge. Seriously, 30 days! You’re lucky if you get a day and a half out of an Apple Watch. 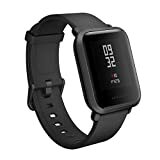 On top of that, if features GPS, heart rate monitoring, sleep tracking, and more, and it’s on sale for just $79.99 right now on Amazon.